Endodontists are dentists who specialize in saving teeth through endodontic therapy; the procedure involves the soft inner tissue of the tooth, called the pulp. Like many medical terms the word "endodontic” is Greek and comes from "endo" meaning inside and "odont" meaning tooth. All dentists are trained in diagnosis and endodontic therapy. An endodontist has 2 years additional post graduate training. They study root canal techniques and procedures in greater depth, for diagnosis and treatment of more difficult cases. For this reason, many dentists choose to refer their patients to an endodontist. After determining the need for endodontic treatment, the procedure is started by giving a local anesthetic. Then a sheet of latex (or non latex) called a "rubber dam" will be placed to isolate the tooth, to keep the tooth clean and dry during treatment. Following these steps a small access hole is made through the biting surface of the tooth. The pulp is now removed while the canals are cleaned and shaped. 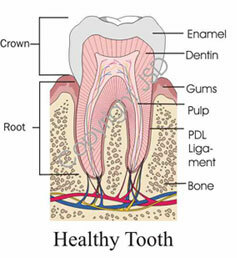 The tooth is then filled with gutta percha (a filling material) that is placed to seal the canals. In some cases the gutta percha may be placed at a second appointment. The procedure usually can be completed in one to two visits depending on the required treatment. After finishing the endodontic treatment a temporary filling is placed in the access hole. When your treatment is completed, you will need to contact your general dentist for the final restoration. Your general dentist will replace the temporary filling in the access cavity with a permanent restoration. Most patients return to their normal daily routine after treatment. An apicoectomy is a procedure in which the endodontist opens the gum tissue near the tooth to see the underlying bone and to remove any inflamed or infected tissue. The very end of the root is also removed. Success for Endodontic therapy is greater than 90%. If your tooth is not amenable to endodontic therapy or the chance of success is unfavorable you will be informed at the time of an evaluation or when the complication becomes evident during or after a treatment. If an endodontic treatment is unsuccessful or fails you still have options. With proper care a tooth having previous endodontic treatment will last as long as other natural teeth. Occasionally these teeth fail to heal or pain continues despite therapy. Although rare, sometimes a tooth that has initially responded to endodontic therapy may also fail. When either of these situations occurs, the tooth often can be maintained with a second endodontic treatment. Toothaches relating to cracked or fractured teeth can often be difficult to pinpoint. Because of the vast network of nerves in the mouth, the pain of a damaged or diseased tooth often is felt in another tooth and/or in the head, neck, or ear. 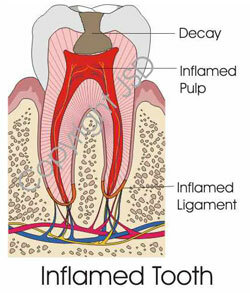 Endodontists are specially trained in diagnosing and treating this type of pain. Pulp damage is sometimes caused by a blow to the mouth, and the endodontist specializes in treating these traumatic injuries. For example, a blow to a child's permanent tooth that is not fully developed can cause the root to stop growing. A procedure called apexification stimulates bone to be deposited at the end of the root which makes it possible to then save the tooth through an endodontic procedure. Endodontists are specially trained in procedures for replanting teeth that have been knocked out of their sockets.